Even with all the known privacy concerns floating around the world’s biggest data mining companies like Facebook and Google, you gotta hand it to Chrome for at least appearing to want to protect its users. In a recent announcement on the Google Webmaster Central Blog, we learned that in version 71 of the world’s most popular internet browser (to be released in Dec, 2018), you’ll get a ‘sober second chance’ to back out of potentially shady mobile sign up pages. The idea is that Google will flash a page (similar to the ‘deceptive site ahead’, but without the blood red screen), which will allow you to back out of the page, or proceed should you wish to. I’d wager that Google wouldn’t build this sort of alarm system into its browser if they didn’t already have comprehensive knowledge of millions of unsecure transactions occurring through shifty online forms. They are attempting to reduce the amount of surprising charges that show up on mobile phone bills due to lousy mobile experiences and unclear communication, whether it be intentional or not. An underlying message here is that it seems we are not scrutinizing our online transactions well enough, so Google has to tap us on the forehead and ask “Are you sure?”. Here’s a perfect example which is also explained in the original post. Picture a user who is surfing online game sites and is confronted with a sign up form in order to get access to a “Tips and Tricks” section. It’s so easy! Just add your phone number and get all the juicy game cheats and tutorials! Seems simple enough, right? Nope, check out the fine print. 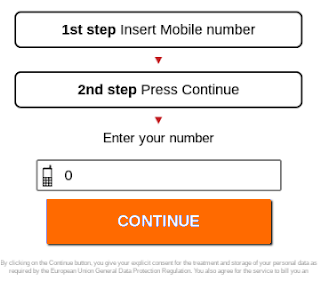 By clicking on the Continue button, you give your explicit consent for the treatment and storage of your personal data as required by the European Union General Data Protection Regulation. You also agree for the service to bill you a … yadda, yadda. We need to be more skeptical and cautious as we navigate the web, especially when it comes to entering personal information into forms. Personal information such as … your personal phone number. Ask yourself, is this really worth the risk? Couldn’t I just watch a couple of Youtube videos instead? If it’s an APP, read a bunch of reviews. Are they ‘mostly’ good? Scroll to the negative reviews and see if there’s a trend or comments about mobile charges. The community can be a very sobering voice if there’s any uncertainty or concern. Or at least that could be a heinous excuse for suspect pages to omit critical subscription info. 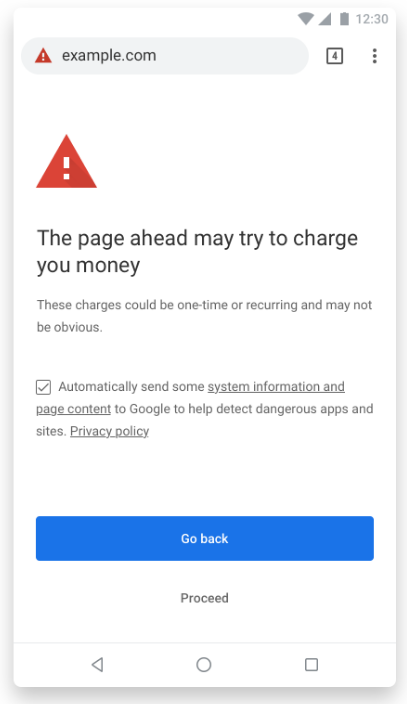 Google is attempting to clearly tell people when they are entering a billing sequence and whether the website is transparent about any and all subscription charges based on these mobile billing guidelines. Is the billing information visible and obvious to visitors? Can customers easily see the costs they’re going to incur BEFORE accepting the terms? Is the fee structure easily understandable? If Chrome can’t easily identify those basic requirements, they’ll chuck you the warning screen as shown above. Since they feel this is a pretty serious issue, indexed pages like this will be flagged and webmasters will need to apply for a sort of ‘re-inclusion’ and in the process, detail how they’ve improved the billing flow. One final note was that if you happen to find yourself flagged in this way, it won’t affect your Google search rankings. However you’ll certainly want to correct any issues with your mobile forms. We would of course, be happy to analyze your forms for any obvious issues.